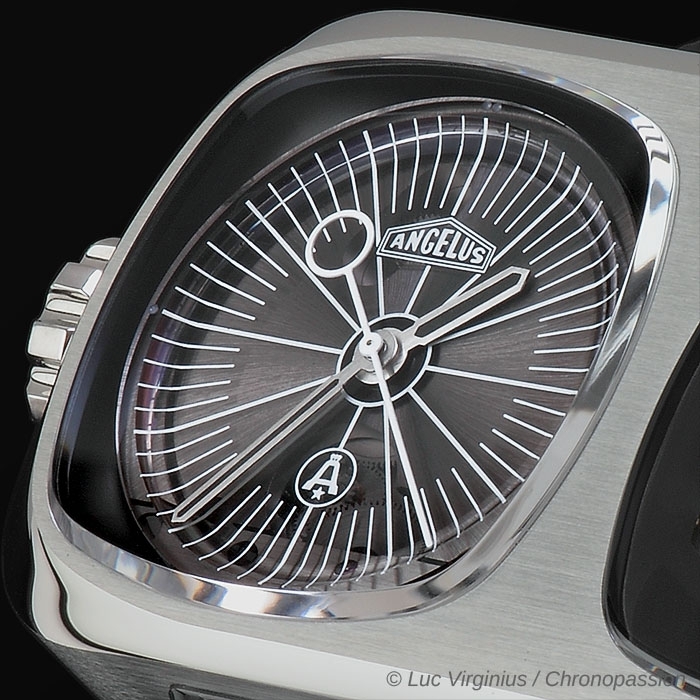 Angelus | 106'700 € Tax inc.
Swiss watch brand Angelus has returned to the forefront of contemporary high-end watchmaking with the launch of the U10 Tourbillon Lumière. 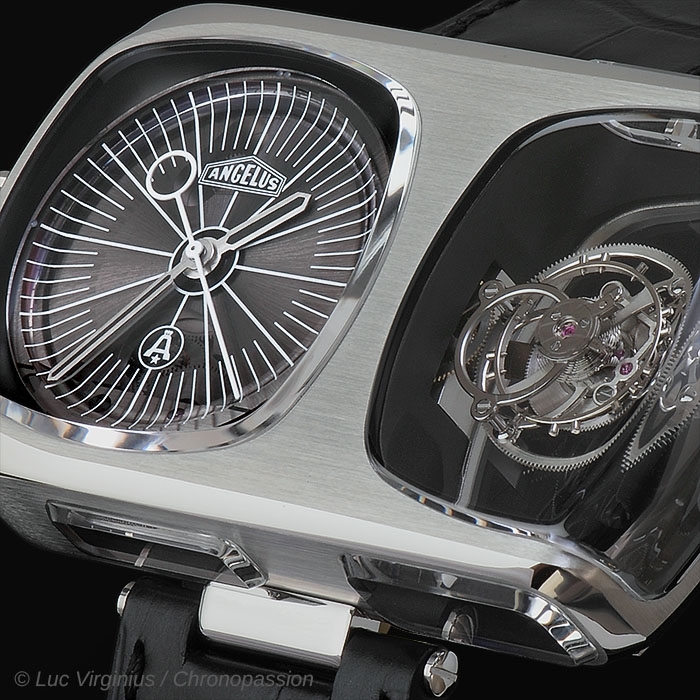 Boasting a radically deconstructed movement, the U10 Tourbillon Lumière features hours, minutes, dead beat seconds and a one-minute flying tourbillon, plus a 90-hour linear power reserve indicator on the case profile. The clean, modernist displays pay tribute to Angelus’ acclaimed travel clocks as well as taking cues from iconic industrial designs and designers of the 1960s and ‘70s. 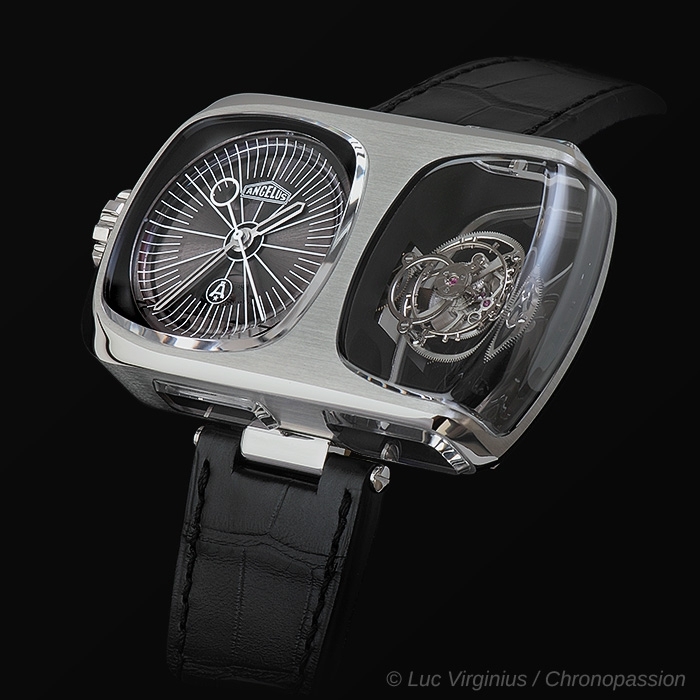 On one hand the U10 Tourbillon Lumière is classic haute horlogerie. 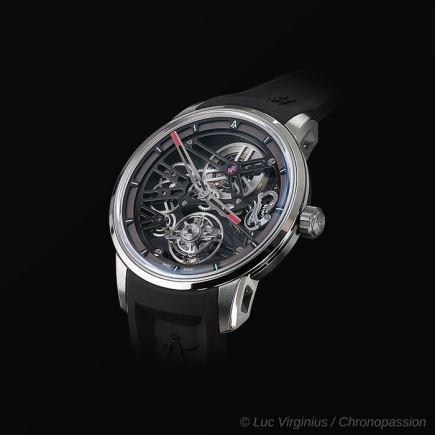 Its dead beat seconds complication – where the second hand advances in full steps of one second – derives from 18th-century pocket watches; the movement bridges and plates are in traditional nickel-silver that is bevelled and polished; and the traditional 2.5Hz / 18,000 vph of the screwed balance with Breguet-overcoil is a throwback to some of Angelus’ early pocket watches. 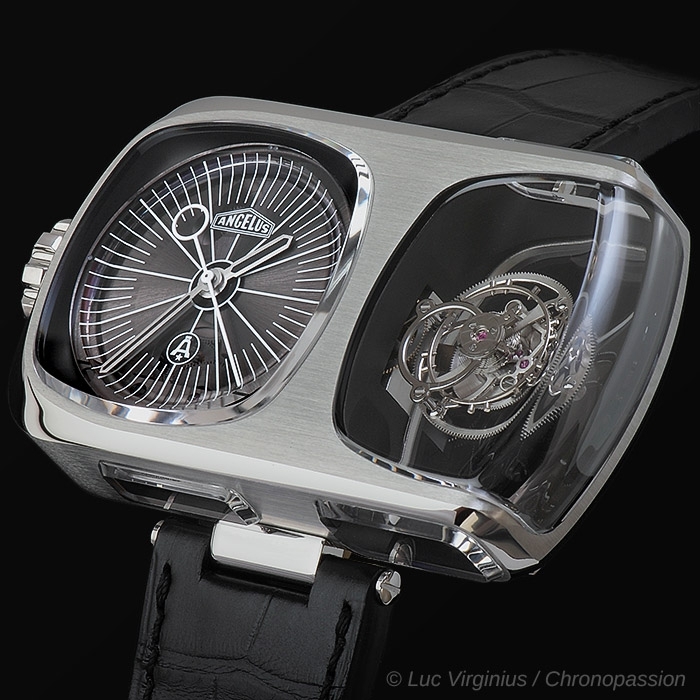 Four of these crystals – including one wrapping 90° over the end of the case – surround the tourbillon, allowing unfettered views to the beating heart of the timepiece. The large windows also let light flood in and shine a spotlight on this mechanical centrepiece. 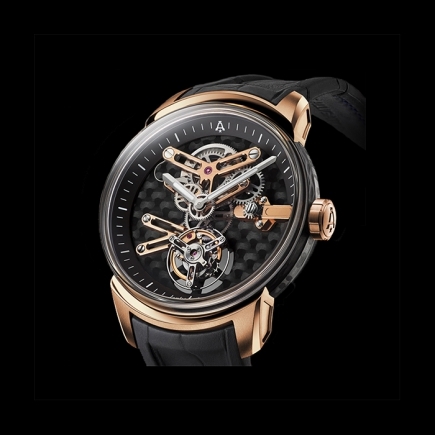 The vitrine aspect of the tourbillon space is cleverly enhanced by light-absorbing, matte black PVD finish on the interior walls encasing the tourbillon. 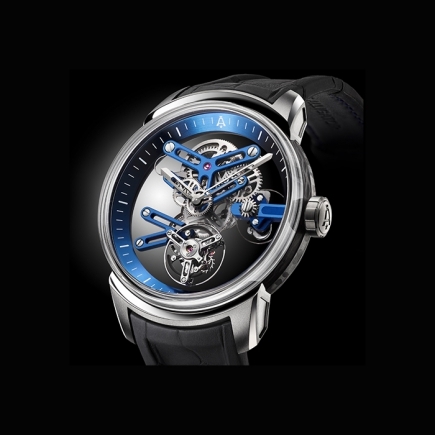 With its generous 16.25 mm diameter, the hand-polished tourbillon cage is crafted from weight-saving stainless steel, while titanium has been chosen for the tourbillon bridge due to its strength, low density and shock-absorbing qualities. 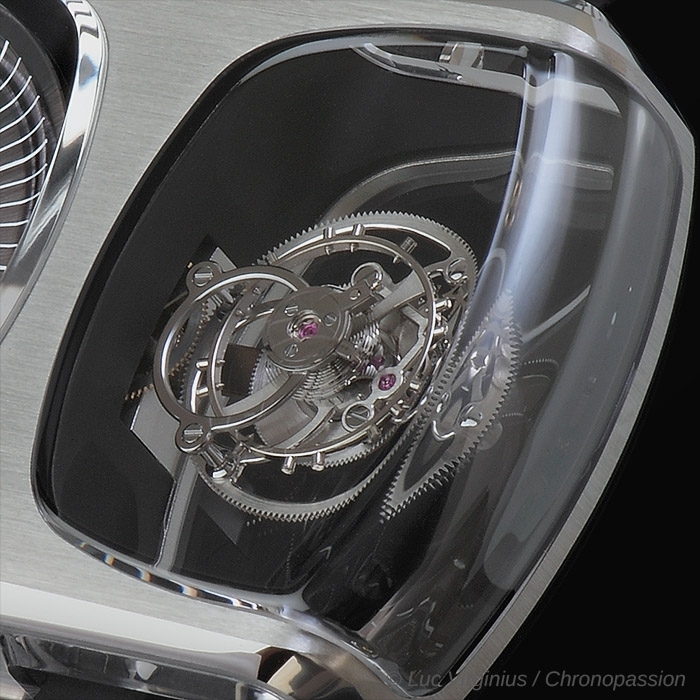 The flying tourbillon configuration does not need an upper supporting bridge and offers unimpeded views to the top of the regulator. 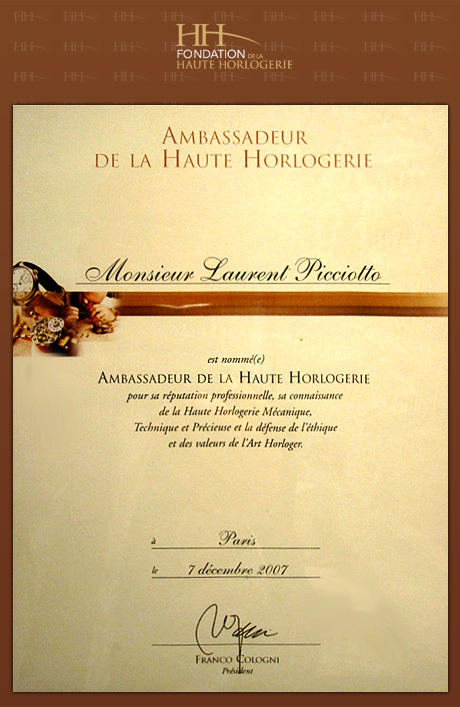 The combination of nickel-silver, titanium and stainless steel in a series watch movement is unique. 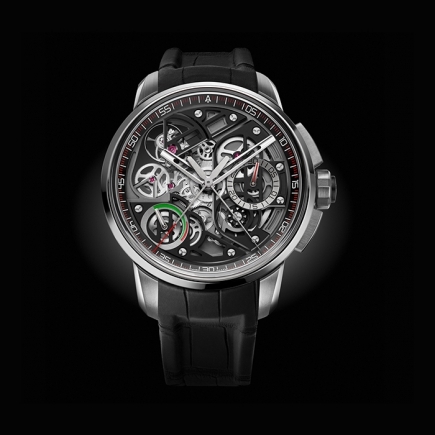 Supporting the two mainspring barrels (which are in series for better timekeeping precision) is a bridge featuring a high-tech laser-engraved, satin-finished, criss-cross pattern. The two ratchets are also laser-engraved and enamelled. 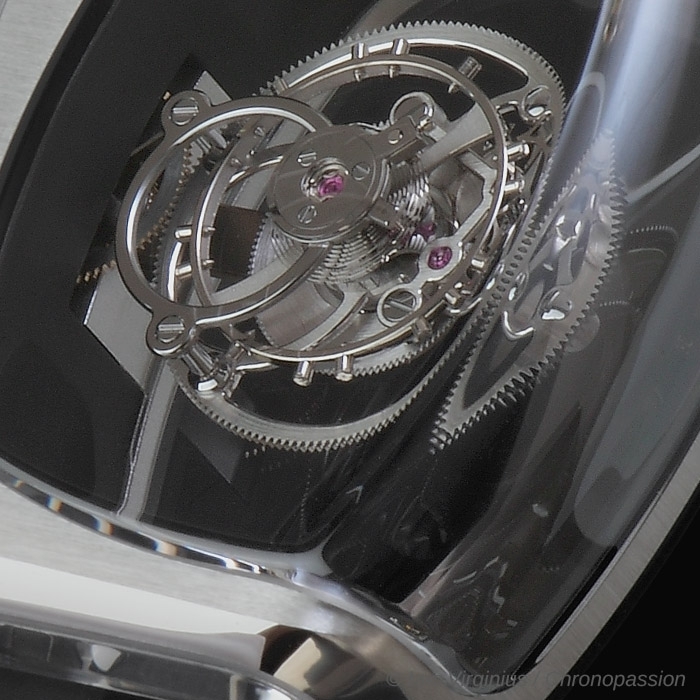 A large diameter one-minute tourbillon requires significant energy, which is amply supplied by the dual main spring barrels. 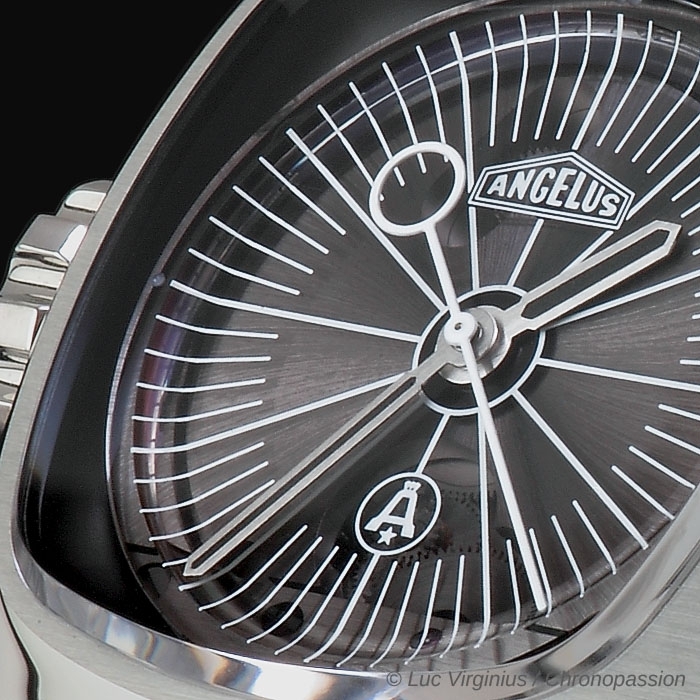 When fully wound, the Angelus A100 calibre provides a very healthy 90 hours of optimal power. The two mainspring barrels are optimally sized in a special ratio for a flatter torque curve, which maximizes accuracy throughout for the full 90 hours. 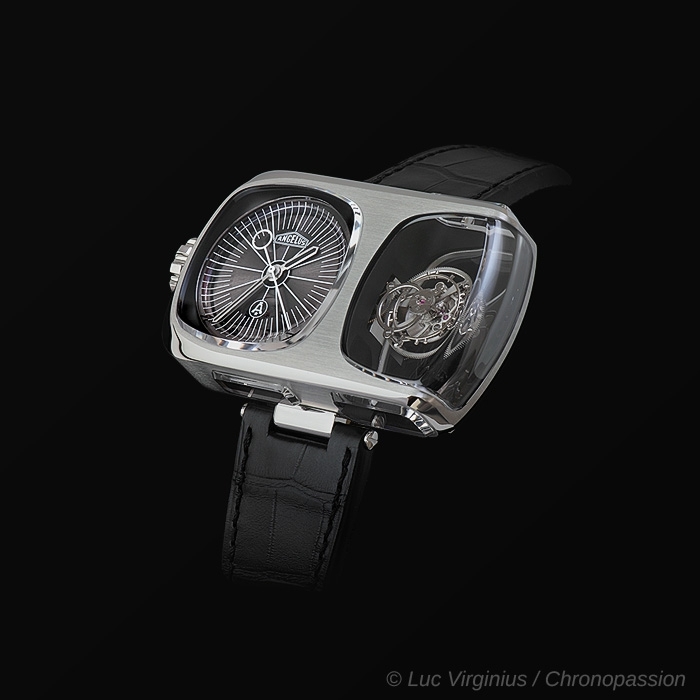 The crown, purposefully oversized for ergonomic winding, is inset neatly into the case in harmony with the case’s contours. 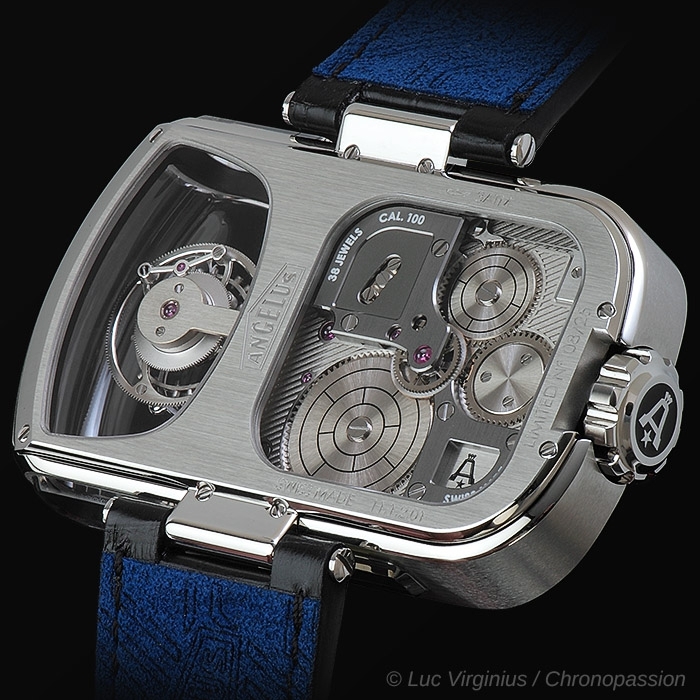 The hour and minute hands – brushed finished, rhodium-treated and filled with black Super-LumiNova that glows blue in the dark – are actually set into the concave dial made of grey-tinted sapphire. Like the interior of the tourbillon vitrine, the walls of the dial recess have also been bead-blasted to a matte finish and then black treated. Tiny holes drilled into the dial at 12, 3, 6 and 9 o’clock and filled with Super-LumiNova create bright white markers. While the dead beat seconds hand’s step-by-step motion is the result of a traditional horological complication, the stepped seconds is also reminiscent of quartz watches. 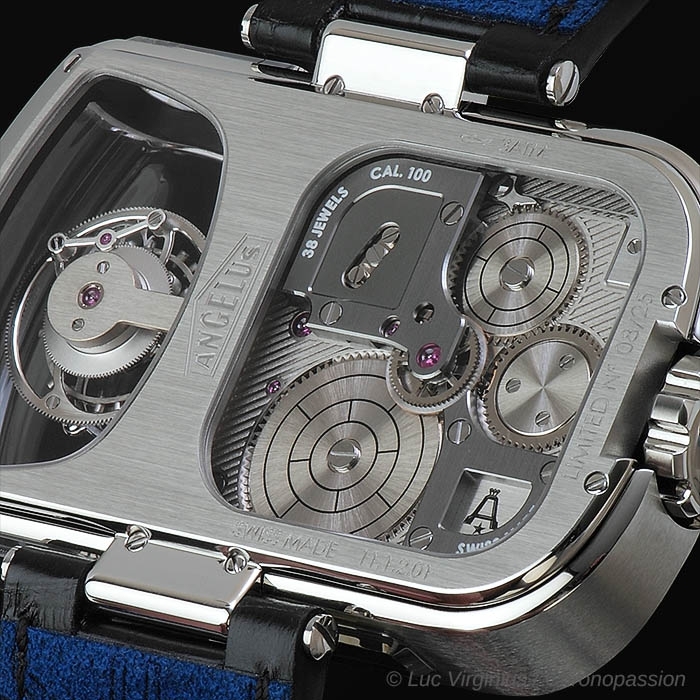 “This timepiece has dead beat seconds to honour an historically important horological complication but also to evoke the jump of the second in a quartz movement.